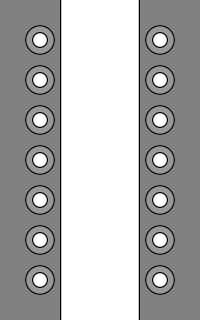 A version of Progressive Lacing using U-Lace no-tie laces instead of regular shoelaces. Crossovers run progressively steeper – and hence feel tighter – towards the toes. • Use two U-Lace segments to lace a tall "X" from the bottom eyelets to the eyelets just above the middle. One segment runs up and left, the other runs up and right. 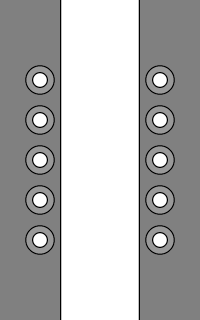 • Use another two U-Lace segments to lace a shorter "X", with the bottom of each segment starting two rows higher and the top finishing one row higher. • Continue lacing progressively shorter "Xs" – with the top of each "X" finishing one row higher – until the top of the shoe. 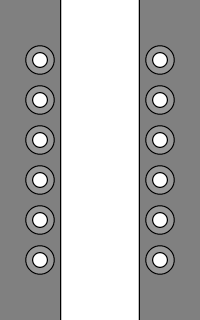 • Use two U-Lace segments to lace a tall "X" from the bottom eyelets to the middle eyelets. One segment runs up and left, the other runs up and right. • Continue lacing progressively shorter "Xs" – with the top of each "X" finishing one row higher – until the second row from the top of the shoe. • Use a final U-Lace segment to lace straight across the top eyelets. • This lacing feels progressively tighter towards the toes because the taller "Xs" are stretched more tightly. 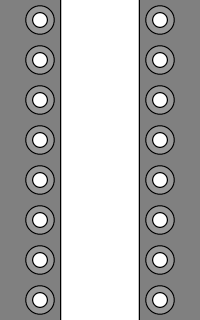 This is the exact reverse of regular Progressive Lacing, which feels progressively tighter towards the ankles. 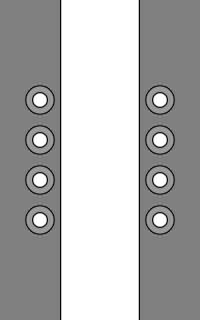 • The lacing may be inverted – tall "Xs" near the top and short "Xs" near the bottom – so that the lacing feels progressively tighter towards the ankles. Converse Chuck Taylor All Star Syde Street Leather Mids with U-Lace Progressive Lacing. This page last updated: 11-Jan-2019. Copyright © 2018-2019 by Ian W. Fieggen. All rights reserved.